This lizard becomes bipedal in pursuit of prey or when fleeing predators such as large snakes, hawks and roadrunners. 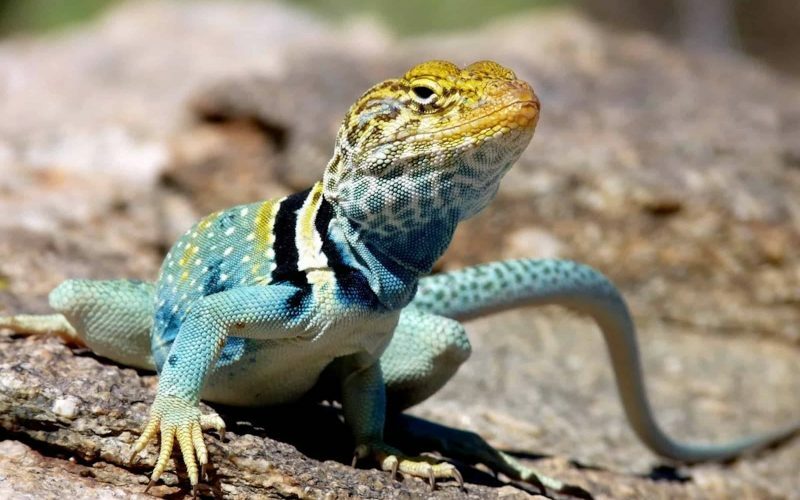 The author saw an Eastern collared lizard ‘running’ across the Esperero Trail in Sabino last fall. A large lizard, 8 to 14 inches long, it lives amongst rocks and likes mountain slopes, alluvial fans and gullies for sunbathing and easy access to protective cover. They are uncommon around here as evidenced by the fact that the author has only seen four in the last 8 years; in the Southwest they range throughout Arizona and the northern half of Sonora, Southern California and Baja, California. They are ferocious predators that eat insects, smaller lizards and other animals that pass close by. These lizards will become bipedal in pursuit of prey or when fleeing predators such as large snakes, hawks and roadrunners. The female is less colorful but develops spots and bars of red or orange on the sides of the neck and body during the breeding season that extends from mid-May to early June. During the courting ritual, the male shows off his bright colors while prancing around the female. Twenty days after breeding, 2 – 21 creamy-white leathery eggs are laid in a burrow beneath a large rock. The young hatch in 3 to 4 months and are 3 – 4 inches long. These lizards have strong jaws and sharp teeth but are non-venomous. This colorful male was photographed in November 2003 on the Romero Pools Trail.